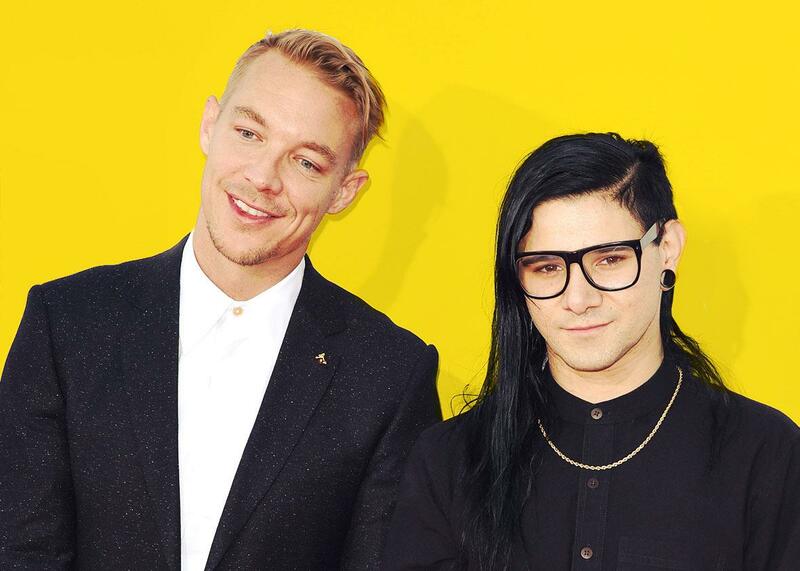 The year producers like Skrillex and Diplo became as big as pop stars. Entry 15: This was the year the producers became as big as the pop stars. Diplo and Skrillex arrive at the 2015 American Music Awards on Nov. 22, 2015 in Los Angeles. Photo illustration by Lisa Larson-Walker. Photo by C Flanigan/Getty Images. Before we pack it in for the year, Carl, your musings about the producer-forward “Neofuturist Aesthetic” make me want to circle back to something you mentioned in passing in your introductory post: We’re living through a sea change in pop music where figures formerly relegated to the background—producers, writers, even top-liners in a few cases—now have the potential to become just as famous as the pop stars themselves. Songwriter-to-the-stars Sia stepped out from the shadows (well, sorta; she’s still got a paper bag on her head) and is about to release an album’s worth of songs she initially wrote for other people. Diplo and Skrillex, who joined forces as Jack Ü, were considered as instrumental to Bieber’s 2015 reinvention as Bieber was (if not more). Superproducer Max Martin used to be the industry’s unsung secret weapon; now he’s something of a household name. Hell, even Drake’s right-hand-man, producer Noah “40” Shebib, has almost a quarter million Instagram followers. It’s never made much sense to treat pop music like the work of one omniscient auteur, but it’s nice to see some fans developing a more collective appreciation for how their favorite songs come together, and celebrating the talents of some of the more introverted players in the pop game. Carl, you brought up Grimes, and I think she’s a great, hopeful note to end on here. Her kaleidoscopic, K-pop–influenced odyssey Art Angels was one of my favorite records this year. It took more than three years for her to follow up her hypnotic breakthrough album Visions, and a big part of that was because she wanted to produce the whole thing herself, and play every single instrument on it. The commanding Art Angels showcases how Grimes has grown as a producer just as much as she’s matured as a songwriter and a vocalist, and in an industry where women are rarely given the same kind of credit for their technical achievements, it’s a bold declaration of independence. I hope it makes ripples. That’s all for me—it’s been so fun passing notes with you all this year! Julianne, curious to hear if there are any other unsung producers you’d like to shine a spotlight on.